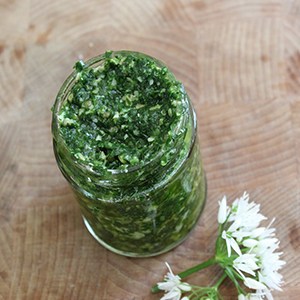 Wild garlic is one of those delightful plants that makes spring foraging a real treat. We use it for all sorts of things here at VHK – soup, soda bread, even preserving it with salt, but this pesto recipe is one of our favourites. You can use pine nuts instead of sunflower seeds, but please give the sunflower seeds a chance. It is delicious on pasta, works wonders as a simple dip and makes a slightly dull sandwich sing. Go on, give it a try! Wash the wild garlic carefully, ensuring there are no other leaves in the mix. Finely chop and add to blender with the sunflower seeds. Blend until smoothish. Add the cheese, salt, vinegar and oil and blend again. Stir with knife or spatula. Put in small jars until ready to use.